Once you start to get the ball rolling with your Amazon FBA sales, you’ll notice these expenses that are tapping into your profit margin. And one expense you cannot avoid is the cost of shipping. Whether you are an Amazon FBA or FBM seller, shipping will hit your bottom line. Electing to sell on Amazon FBA will greatly reduce your shipping costs. That’s because you reap the benefit of Amazon’s amazing discount with UPS. 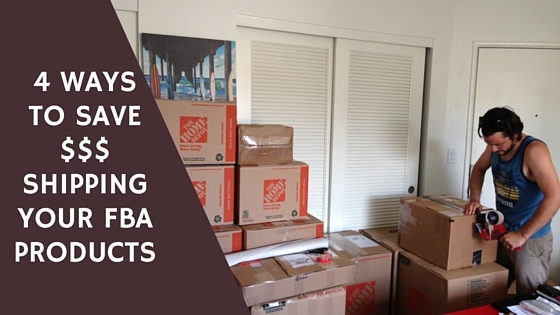 If you’re not familiar with what FBA entails, you can check out my article about FBM vs. FBA. Basically, when you choose Amazon FBA you ship all of your products to Amazon and then they ship them to the buyers as each purchase is made. With Amazon FBM, however, you would hold onto your inventory and ship each unit as it sells. And as a result, you don’t fully benefit from Amazon’s shipping discounts. Bottom line, Amazon FBA is convenient and saves you money on shipping. The thing is, not many items will fit perfectly into the shipping boxes you are using. And if you want to ship one or two items at a time, you probably won’t be using up all the space in the box and not taking advantage of UPS’ billable weight terms. In the past, UPS (Amazon’s FBA courier) would charge you based on shipping weight. However, UPS recently changed their pricing to something called billable weight. While this does take weight into consideration, the major factor is the box’s dimensions. You’ll soon find that shipping a box that is 20x20x20 with 20 lbs in it, versus 20x20x20 with 45 lbs in it is not a huge price difference. So fill those boxes up! Caution: Just don’t go over 50 lbs. Amazon does not allow you to ship boxes over 50 lbs if you are sending multiple UPCs. It’s not a problem if you are shipping 60 lbs of one unit, but any time you mix SKUs it’s a no-no. Don’t test them. They can reject your shipment! However, if you go into your settings you can change your shipping settings to Inventory Placement Service. This will allow you to ship all of your products to ONE, maximum TWO warehouses if you are shipping oversized products too. Hallelujah! From your seller’s dashboard, scroll over “settings” in the upper right hand corner. A drop down menu will open and you should see “Fulfillment By Amazon” at the very bottom. Click on that. Now every time you process a shipment, it will all go to the same FBA warehouse! Woohoo! Last, but certainly not least, are the cost of boxes. While shipping can certainly cost quite a bit in it of itself, the actual materials we use to pack the goods can add on up. Who would think cardboard would be so expensive? When Nessa and I first got started, we began hoarding boxes. Anywhere we saw a box, we took it. And then, we realized that we started to have a heaping amounts of different boxes and they were TAKING OVER our 400 square foot apartment. That’s when we decided to just eat the cost and buy them on demand from our local Home Depot. The boxes are sturdy and pretty inexpensive, not to mention that we don’t have to store them in our studio. But, it adds up. With our steady flow of inventory, we found ourselves spending $20-$40/week on boxes. That’s $80-$160/month of profit straight out the door. Then, a friend told us how she contacted the local Skechers retailer and worked out an agreement where she can go and pick up their broken down boxes a couple of times a week. Although we haven’t done this yet, it is something that we are just about to add to our expense-saving activities. Right now, we’re looking for a local store that gets a steady flow of large, sturdy boxes. Also, it’s very important that you avoid getting boxes from grocery stores or any places that involve food, as there could be various creepy crawlies lingering around. And you certainly don’t want that contaminating your products. We’ll keep you posted on our box source when we “land” the deal. So, where are you going to cut your expenses?